PBP History — Sozo Group, Inc. In 2015, two more of Dee’s close friends joined the ministry, Jess Olivito and Lisa Ring, both with powerful testimonies that they share with others – encouraging women to embrace their brokenness through God’s Word and their own creativity. 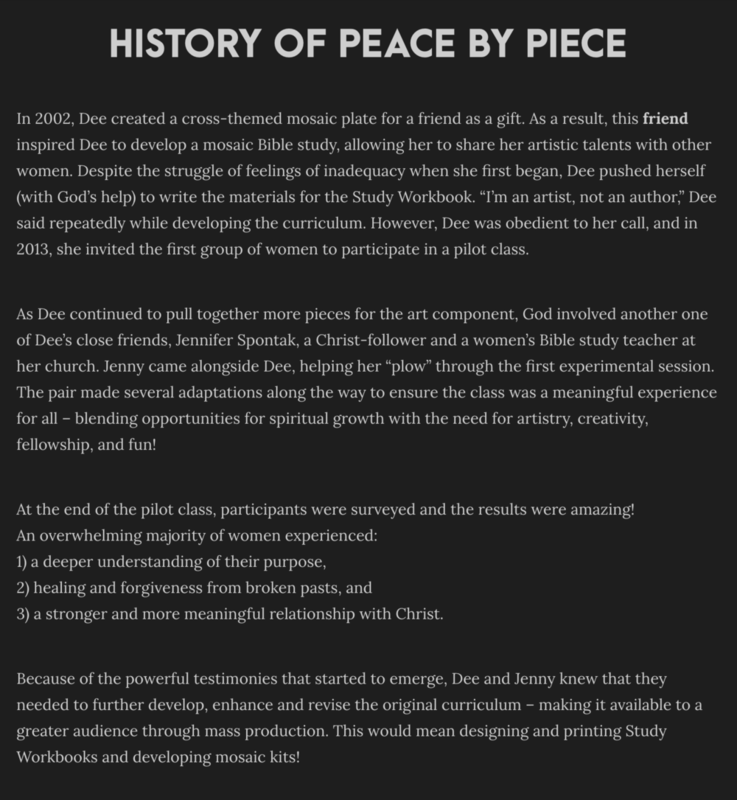 Having participated in the Peace by Piece Mosaic Bible Study curriculum themselves, the two serve as facilitators for workshops, retreats and Bible studies and are always looking to train (disciple) other women wanting to be part of an artistic circle. Due to her marketing background, Jess assisted with publishing the Peace by Piece Mosaic Bible Study Workbook and continues to promote the ministry through digital marketing. She also leads the Sozo Group, a grass-roots ministry that supports Christian programming that is centered around the Arts. Peace by Piece Ministries is committed to making our programs known to women and appreciates the support we’ve received from other ministries. Through our parent ministry, The Sozo Group, we’re able to accomplish charitable giving objectives like any other 501(c)3 non-profit organization! Due to her marketing background, Jess assisted with publishing the Peace by Piece Mosaic Bible Study Workbook and continues to promote the ministry through digital marketing. She also leads the Sozo Group, a grass-roots ministry that supports Christian programming centered around the Arts.